Thank you to the following individuals and organizations for generously supporting this project! 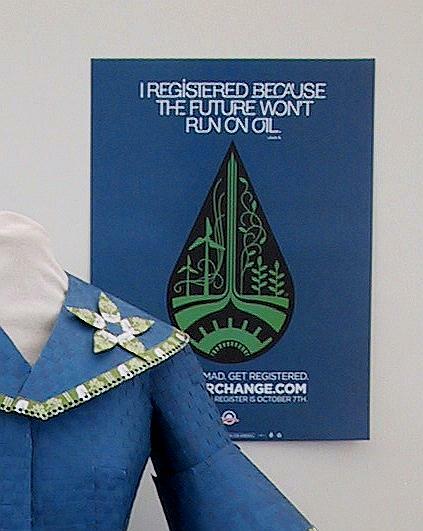 This collection of garments fashioned out of discarded campaign materials, is made up of three garments: the Obamanos Coat, the Obama Cocktail Dress and the Voter Swing Coat. The Collection is a celebration of the millions of people who worked countless hours to assure the election of Barack Obama as the President of the United States. Nancy Judd of Recycle Runway was a devoted volunteer in the Obama/Biden Campaign in Santa Fe. She organized hundreds of people in her neighborhood and inspired friends and relatives across the country to volunteer. This collection is a documentation of her experience being part of this exciting campaign. The day after the election Ms. Judd went “dumpster diving” behind Obama Campaign headquarters in northern New Mexico. She filled her car with historic campaign materials that she transformed into elegant garments with the help of over 25 dedicated volunteers in two months! Ms. Judd brought the Collection to the 2009 presidential inauguration in Washington D.C., showcasing it at the The Green Inaugural Ball, the reception to honor the New Mexico Congressional Delegation, and the New Mexico Inaugural Ball. The Obamanos Coat has been accepted into the Smithsonian National Museum of African American History and Culture!